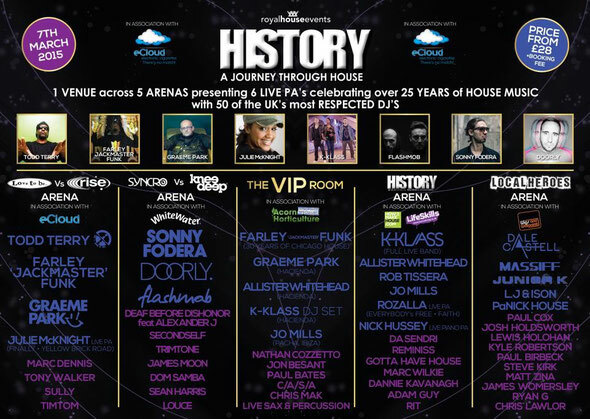 History - A Journey Through House - takes place on Saturday 7 March at Magna Science and Adventure Park in Sheffield. Headlining across five arenas will be over 50 DJs and live PAs who have all made a contribution to house music ever since its birth back in the ‘80s right up to the modern day. Headliners include the likes of Todd Terry, Farley Jackmaster Funk, Graeme Park, Sonny Fodera, Flashmob, Allister Whitehead, Rob Tissera, Jo Mills, Dale Castell, Doorly alongside live PAs from Julie McKnight and a full live band performance from K Klass. Various brands involved include Knee Deep, Rise, Love to Be, History, Syncro and more. The History brand’s aim is to educate crowds and entertain, with DJs who were there at the beginning of house music, alongside artists you can relate to with its current sound. It’s held events in the UK and Middle East, Asia, Marbella, Ibiza and many more.